this is the best pair of wading boots i ever own. 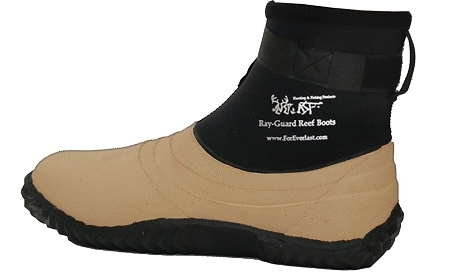 i tested this boots on oyster bed in the houston galveston area and it work perfectly. it does not drag or collect water and warm during the texas winter. this are great boots worth every penny that i pay. These boot give you the protection and support for long multi-day wades. They are constructed well. The only thing I would change is a sturdier velcro strap. Never get in the water without them. I have every size from size 9 to 14 (my son grew up fishing with them and his feet grew) with double pair of some sizes. The fact that I still have all of the boots that I have ever bought over the years speaks well of their durability. They stay on your feet in the squishiest of mud wading and hold up against the sharpest of oyster shell. Walk over shell with confidence, but keep your balance. If you wade without them then you are wading dangerously. I've owned three different flats wading boots, my current Ray Guard boots were a gift four years ago. They are by far superior over other brands, the most comfortable, and do not get a suction in them that will cramp your feet like other brands. They held up well,I use them in very rocky areas, and have excellent footing. Order a half size larger, and wear tube socks with them. I am ordering a new pair for myself.